When Price and I were on our Babymoon in the Florida Keys we found a place called The Stuffed Pig and absolutely fell in love with it for breakfast. In the 4 mornings that we were there we ate there twice. So yeah, we loved it! The Stuffed Pig is a fun open air restaurant that features down-home fresh cooking. It’s a simple place with plastic chair with a gravel ‘flooring’. Pick up a laminated menu or check out the specials on the chalkboard to select some damn good breakfast or lunch. 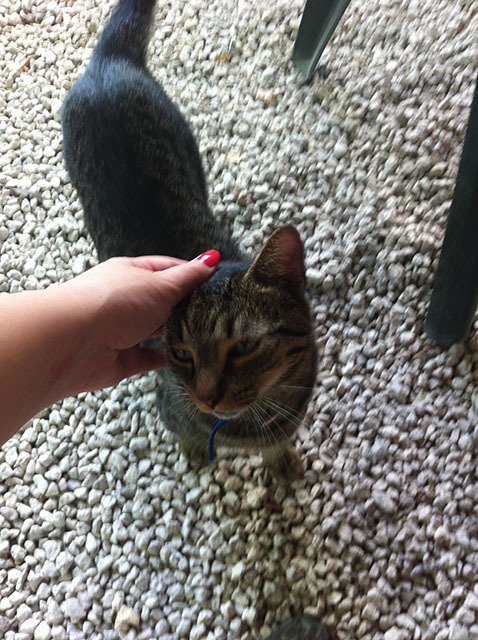 And be sure to say hi to the cats that roam around the property. On the first morning we went there I got the Shrimp and Grits. So much food!! I skipped the toast and just dove right into the rest. I took the time to take the shrimp off the skewers and then took the tails off so I could get a shrimp with every bite of cheesy grits and eggs. I made a friend on the first day. 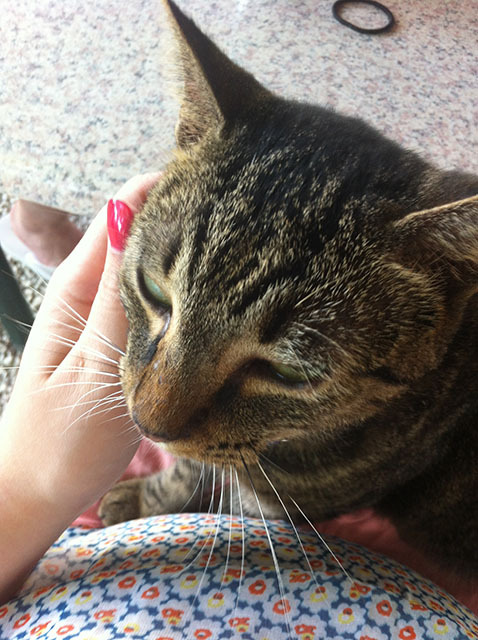 Tigger the cat was very friendly so she rubbed up all against the belly bump and kneaded the napkins I had on my lap. Then sat on my lap while I ate, I think she was hoping I’d share some shrimp! Price also enjoyed one of the breakfast specials that had a pancake, scrambled eggs, bacon, sausage, grits, and toast. Basically, a half portion of their World Famous Pig’s Breakast. As well, they have $2 mimosas and $3 Bloody Mary’s!!! I was so jealous of Price as he enjoyed them with his breakfasts. I figure it is just another reason for us to go back- when I’m not pregnant- to enjoy their great food and very, very affordable drinks! 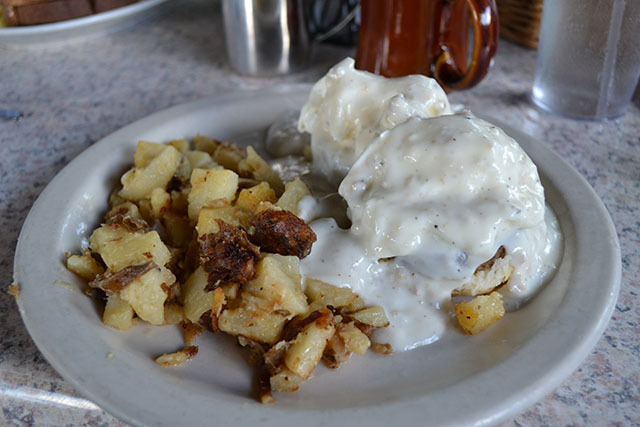 Of course when I saw they had a Sausage and Gravy Eggs Benedict on the special’s menu I had to get it. It’s a great combo of 2 great breakfast plates. It was a change up for me since I love Hollandaise sauce so it was a big departure for me not to have that when having Eggs Benedict. But I embraced the change and really enjoyed the special. As well, instead of the typical English Muffins the Eggs Benedict was set upon freshly made biscuits. They biscuits were really tender and soft. They became a great sponge to soak up the sausage gravy and runny egg yolks. Then a sausage patty was set upon each biscuit to make this super sausage-y. That’s right double sausage!! The side of homefries were great as they were well seasoned with the onions they were cooked with and from some of the char they had from the griddle. It was really good to mix them into the sausage gravy.